ROME, Italy, August 27, 2016 (ENS) – Today, Italians joined in a day of national mourning for victims of the 6.2 magnitude earthquake that struck central Italy on Wednesday, killing 291 people. Italian Prime Minister Matteo Renzi and President Sergio Mattarella joined mourners at a state funeral for 35 victims at a community gymnasium in the town of Ascoli Piceno, capital of the March region. The funeral was celebrated by Bishop Giovanni D’Ercole in the gymnasium adjacent to the Mazzoni hospital. 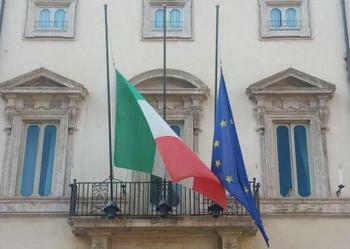 In conjunction with the ceremony, the Prime Minister declared a national day of mourning with the display of flags at half mast on public buildings throughout Italy. 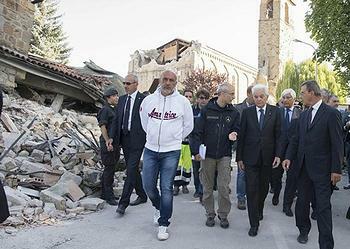 The Council of Ministers Thursday approved a state of emergency for the affected areas, and Italy’s civil protection agency released a higher death shortly before funeral services began. The hardest-hit town was Amatrice, which now has 230 confirmed deaths. The death toll is still rising, as searchers recovered three more bodies overnight from the rubble in the hilltop town. Elsewhere, 11 were killed in Accumoli and 49 in Arquato del Tronto. Residents of central Italy were shaken by a series of aftershocks overnight, the strongest measuring 4.2. One aftershock collapsed the only northern entrance to Amatrice, the small Tre Occhi Bridge, blocking rescue vehicles and ambulances. Residents could reach their homes only after a half-hour walk in scorching heat. Bulldozers were working to complete a new 700-metre-long bypass into the town close to the collapsed bridge. In the Italian government’s first relief measures following the Wednesday disaster, Premier Renzi Thursday authorized a preliminary 50 million euros (US$55.98 million) in emergency funding and canceled taxes for central Italy residents. Nearly 1,000 aftershocks have shaken Italy’s central Apennine Mountains since the first quake. The biggest aftershock hit with a strength of 4.7, according to the U.S. Geological Service, USGS. The August 24 earthquake occurred as the result of what the USGS calls “shallow normal faulting” in the Central Apennines, which runs from the Gulf of Taranto in the south to the southern edge of the Po basin in northern Italy. The largest recorded earthquake within 100 km of Wednesday’s event was the January 13, 1915 magnitude 6.7 earthquake, which occurred 68 km to the south-southeast near Avezzano, killing approximately 32,000 people. In September 1997, a magnitude 6.0 earthquake 50 km north-northwest of the August 24, 2016 event killed 11 people, injured over 100 others and destroyed some 80,000 homes in the Marche and Umbria regions. This 1997 quake was part of a series known as the Umbria-Marche seismic sequence, which included eight events of magnitudes greater than 5.0 in the two months between September and November of that year, including the quakes that damaged the Basilica of St. Francis in Assisi. In April 2009, a magnitude 6.3 earthquake 45 km to the south-southeast of Wednesday’s event, near the town of L’Aquila, killed at least 295, injured over 1,000 and left 55,000 or more homeless. The L’Aquila earthquake resulted in major landsliding in the local area, and was followed by a vigorous aftershock sequence, including five other quakes of magnitude 5.0 or larger. The preliminary location of Wednesday’s earthquake appears to be in a gap between the aftershock sequences of the 1997 and 2009 events, said the USGS. drone video shoot by the Vigili del Fuoco, Italy’s national agency for fire and rescue services, shows the extent of the devastation in Amatrice, in central Italy, after the earthquake on August 24, 2016, that hit the region, northeast of Rome.